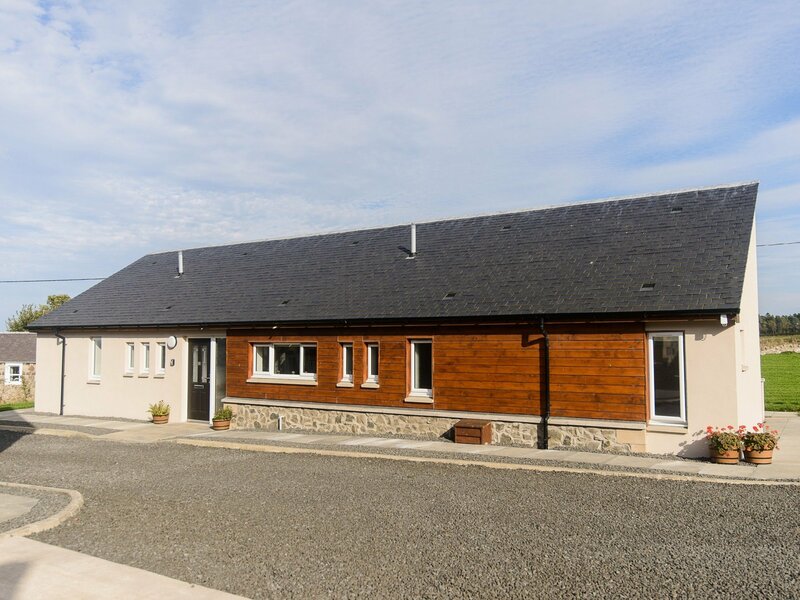 Lodge 2 at Elderburn Luxury Lodges is a stylish and contemporary lodge positioned on the East Coast of Scotland. St Andrews' iconic Old Course is only three miles away and there are many other world class golf courses in the area as well. This house is spacious and beautifully furnished throughout with large windows so you can enjoy the superb vistas of stunning countryside all around. Patio doors open to an outside dining area so why not dine al fresco after a day exploring the area. The lodge is just three miles or so from St Andrews, which offers a wide range of things to see and do. Visit historical buildings, beautiful beaches, shops or dine in some very fine restaurants, cafes and pubs. Take a walk on the Fife Coastal Path or explore further afield the choice is yours. There is parking for 2 cars directly outside the house, with a concrete pad to keep your feet clean and allow easy access. There are 2 picnic tables on the patios, and access to the gardens and lawn in front of the house. This bungalow has been thoughtfully designed for families or couples, with each en-suite bedroom in its own "wing" with the open-plan kitchen, living and dining area in the centre of the house. There are TVs in each bedroom, and also in the living area, with a DVD player. We have a huge selection of DVDs, books, magazines and board games for you to choose from. There is also a box of activities for kids to keep themselves entertained. There are floor-to-ceiling window on 3 sides of the livingroom, one being a patio door out to your own patio area. Being a bungalow with level entry from the car park this house is fully accessible for anyone with walking difficulties or a wheelchair. One en-suite has a large walk-in shower, and the other has a shower over the bath. We also have a shower seat, high chair and travel cot available on request. Lodge 2's living room with its huge windows looks out onto our garden, and beyond to St Andrews and the North Sea in the east on the horizon. The views to the north span around 50 miles away to the Angus Glens. It has to be seen in person to truly appreciate it. Scotland's best kept secret for 40 years! Michelin -starred. Exceptional food for a special occassion. Must book!